NEW WESTMINSTER, B.C. – Hipsters are the worst, am I right? The way they try to be oh-so-original – liking obscure bands that you probably haven’t heard of, drinking fancy craft beer instead of a classic Caribou, and getting all their “vintage” clothing from outlet stores. Um, well now. This is rather awkward. As my glasses, plethora of plaid, and aesthetic construction would suggest, I like hipster fashion – and I get a little frustrated at its public denigration. Complaints seem to perpetually be about how contrived hipsters are; how they put so much effort into the selection of thick frames, vinyl, and ukuleles they don’t actually play. The problem with this line of criticism, though, is that all style is constructed; we make conscious choices when shopping, selecting items that suit our values and style. When we shop for clothing, we do so in an effort to represent ourselves, or at least our sense of style. Very few people walk around wearing a garbage bag, and even that would make a statement (Google the ‘80s “punk” movement for that). Whether you’re choosing thick-rimmed glasses, Ugg boots, or basketball shorts, each item says something about yourself and the image you want to present to the world. Saying one sense of style is “too constructed” makes no sense when all fashion is purposeful – in other words, contrived. Maybe the problem is that hipsters appear to be inauthentic. They shop at Urban Outfitters, while overtly shirking the mainstream. They put so much effort into their appearances, while heaving sighs over people who exclusively frequent high-end stores. These sorts of contradictions would mean hipsters are hypocritical at best, and entirely fake at worst. But style is made up of choices, which are sometimes contradictory. Hell, life is made up of choices that are sometimes contradictory. I don’t eat meat, but I will occasionally buy higher quality leather shoes. Does that mean I’m inauthentic? Or does it mean that leather shoes tend to last longer? So many choices go into a person’s style, but sometimes it’s a simple matter of liking how something looks. So what if a vintage-looking lace dress is from Top Shop, rather than the result of hours spent hunting through bins of stained, torn, second-hand clothing. Who cares? Goth, grunge, punk, hippie, beatnik – wait a second! All of these styles have something in common: they began as alternative, and then were co-opted by the mainstream as they grew in popularity. Hipster fashion began as a way of subverting what’s popular, doing quaint little things like shopping at second-hand stores and making DIYs. As more people began wearing increasingly big glasses, it made sense for companies to take note and begin selling those items. And thus, vinyl became more widely available outside of dusty old record stores, and finding the perfect plaid became a simple matter of trudging down to TNA. I’m perfectly fine with admitting that my style is constructed. I own a ukulele that I only pick up occasionally, I like taking pictures of my food, and when my bank account isn’t hurting so much, I like stopping by Urban Outfitters and salivating over stuff I shouldn’t buy. The choices I make in fashion are no more and no less contrived than the choices other people make. Even someone who purposely buys no-name brand, or wears clothing they inherited from an ancestor makes a statement about subverting consumerism. We’re all constructing our appearances, for ourselves and our public image. 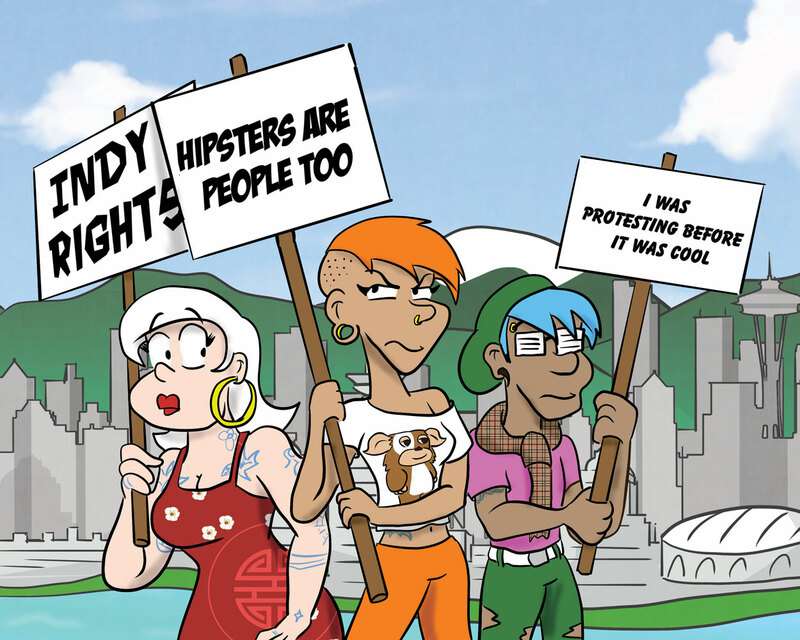 The next time you want to laugh over silly hipsters, consider what choices are behind your own wardrobe.